Posted on 12/14/2015 by Mathew Harkins	in Live Review and tagged Lincoln Theatre, Sharon Jones & The Dap-Kings, soul. 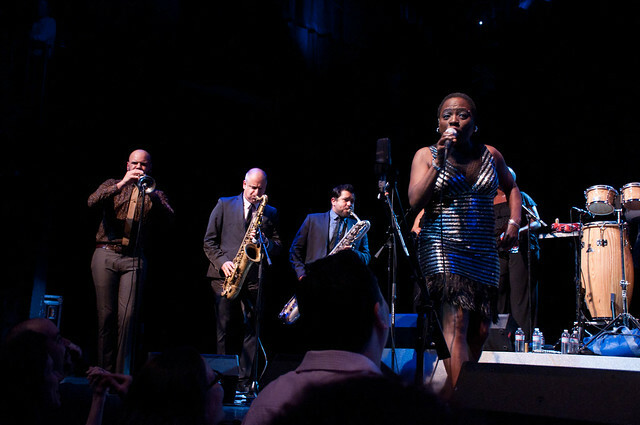 You haven’t seen Sharon Jones & The Dap-Kings until you’ve seen Sharon Jones & The Dap-Kings. By which I mean that you’ve heard the music and the voice, and seen some videos or clips of live shows, but that isn’t really seeing her. Because to see Sharon Jones is to feel her. The energy, the presence, the command that she brings into a room. And I’m not speaking of just any room, but a sold out, standing room only night at The Lincoln Theatre in Washington, DC. This past Tuesday marked one of just two live performance scheduled for this holiday season and Jones brought a dynamic collection of originals, holiday standards, and holiday originals, which were released on her first holiday album, It’s a Holiday Soul Party. The audience hung on every soulful word she sang and every tight, clean note that The Dap-Kings played. For much of the show, the stage at the Lincoln held twelve players: three-man horn section, two back-up singers, two percussionists, a keyboard player, three guitars, and one powerful singer. Four-person bands get compliments when they play tightly and fluidly with one another; 12-person setups are in an entirely different league. The Dap-Kings, mostly decked out in matching crimson suits, played smoothly while working subtle dance moves and taking cues from both Jones and Bosco Mann, the bass player and band leader. Now, one could argue that after 13 years of playing together, Sharon Jones & The Dap-Kings should be tight, should be in sync, and should command a room with ease. And it’s true. They’ve been working audiences for years and growing their fan base as they tell their own tale American soul and funk. But you learn a lot about an artist when you see them working within constraints, and Sharon Jones did that in a way with this show by playing her usual collection of songs intercut with new and old holiday songs. “Just Another Christmas Song,” “8 Days (of Hanukkah),” “Big Bulbs,” “Funky Little Drummer Boy,” and “Please Come Home For Christmas” are just a few of the holiday songs that Jones worked into her set. And these are not necessarily songs that an on-their-feet crowd wants to hear from a band with their own strong catalog. And yet they performed each one with such a unique touch that the crowd almost never sat back in their cushioned seats, except for when Sharon told them to have a seat. The audience followed her command. A woman barely five-foot tall, battling cancer, flanked by an eleven-piece band, belting out her own soul classics and soulful renditions of holiday standards; dancing every step of the way, sometimes with an invited audience member or four on stage. I can’t say if it was the permeating goodwill and cheer of the holidays, or if it was Sharon Jones exuding power and energy, but there was something uniquely special in the air of the Lincoln Theatre. The only other show the band is scheduled to play this month is New Years Eve in Chicago, and it’s hard to imagine them continuing with the holiday songs up until that point. But after hearing the songs played live and hearing the recordings time after time, I can say that It’s a Holiday Soul Party will get you most of the way towards that special feeling. There is still something incredible and unique to seeing live the powerhouse that is Sharon Jones & The Dap-Kings, but you should still give yourself a holiday gift with this album.